Taking over a federal building at the point of a rifle gives protest a bad name. The armed men occupying an isolated federal building in a remote Oregon bird sanctuary say they won't leave until the federal government stops its "tyranny." Yet it's not clear what that tyranny is, exactly. 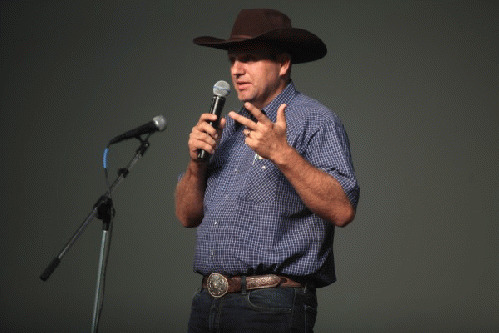 One of the group's leaders is Ammon Bundy, who, along with his brother, participated in their father Cliven's fight against the federal Bureau of Land Management in 2014, when the government tried to move the elder Bundy's cattle off protected land. Their tense standoff with federal authorities became a cause celebre among many movement conservatives. That protest took on a life of its own, with anti-government activists around the country converging on the Bundy farm in Nevada to show their support. In the end, the feds gave up and walked away. It was initially less clear what the younger Bundy wants, besides snacks and Facebook donations. He's since told reporters that he essentially wants two things. First, he wants the federal government to relinquish control of the wildlife refuge where he and his friends are holed up, "so people can reclaim their resources." Second, he wants a lighter sentence for a local rancher and his son. They're serving time after being convicted of committing arson on federal land. There's a range of broader principles at play in the actions of Bundy and his followers. They don't just argue that farmers shouldn't pay federal grazing fees, or that the federal government owns too much land. They say that government's out of control, and the constitution must be defended. (Don't take our guns away, either, they add.) You get the idea. As somebody who's been on the receiving end of the federal government's wrath, part of me wants to sympathize with them. I actually do agree that government is out of control. We have far too many prosecutions for piddling crimes in America. We have draconian mandatory minimum sentences, especially in drug cases. Solitary confinement is so severe here that the United Nations has deemed it a form of torture. But whatever the particulars of the case against the ranchers that started the protests -- they were charged under anti-terrorism laws for burning grazing land -- the federal government has gone very easy on Bundy and his friends. When cult leader David Koresh decided back in 1993 that he was going to barricade himself in a compound with his followers and his guns, federal agents attacked, resulting in the deaths of 80 people. The previous year at Ruby Ridge, Idaho, three people died, including a U.S. marshal, when federal authorities opened fire on Randy Weaver and his family after Weaver missed a court date. Both of those disasters loom large in the imaginations of militia-minded anti-government activists. Yet maybe Bundy and his clan don't understand how good they have it: One can only wonder whether the feds would be standing idly by if Bundy and his white, heavily armed followers were African-American, Latino, or Muslim. Fortunately, we have processes in our country that allow us to challenge the government without taking up arms or holing up in federal buildings. They're called elections. Don't like a law or a federal policy? Petition your member of Congress -- that's a constitutional right. We can also march in the streets, solicit support in the press, and file lawsuits. It's the American way. Taking over a federal building at the point of a rifle, on the other hand, gives protest a bad name. If we all protested that way, our country might look more like Somalia than the land of the free. Anarchy is a poor answer to tyranny.